Dr. Jaclyn Chasse has always played a pivotal role in breaking down barriers that patients face in receiving integrative care. She was a key player in New Hampshire’s 2012 passage of Bill 351, which requires all private health insurers to cover services provided by naturopathic doctors. 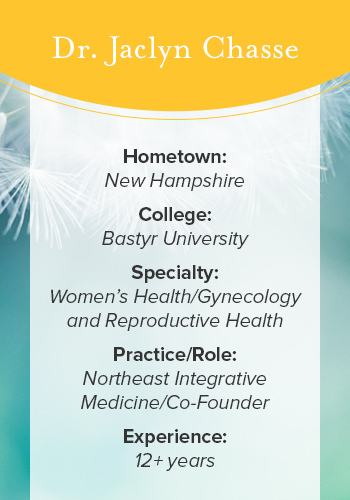 A graduate of Bastyr University, Dr. Chasse handles quality and regulatory affairs for Emerson Ecologics and manages her own practice, Northeast Integrative Medicine, in Bedford, New Hampshire. In 2016, she assumed the role of president of AANP, the American Association of Naturopathic Physicians. Question: What’s the biggest challenge for integrative practitioners today? Dr. Jaclyn Chasse: Owning our rightful place in the healthcare system. There's a lot of competing forces and a lot of things changing in healthcare right now, but the bottom line is what integrative medicine offers is extremely valuable, prevention-oriented, money saving, and it's nearly absent from the current healthcare model. What major barriers exist between patients and getting the integrative care they need? The first major barrier is awareness; many people don't even know we exist. Patients and doctors don't know there are experts like us out there. The second major barrier is financial. Many people in New Hampshire were forced to see a medical doctor because their insurance company wouldn’t cover anything else. When many of the current laws were written, chiropractors didn’t even exist yet. In your experience, how do traditional medical doctors feel about integrative doctors? The majority of clinicians are not territorial or defensive; they're in favor of good patient care. There's still a lot of misinformation out there about our training as naturopathic doctors. As soon as we educate traditional doctors about how rigorous the program is, there are no questions about our expertise. What inspired you to rally on behalf of insurance reimbursement for integrative care in New Hampshire? I'd regularly hear stories from patients that their policies would cover a $15,000 surgical procedure at a hospital, but not a $500 preventative plan with an integrative doc. Our pledge as doctors to "first, do no harm" means different things to different people. We need to be proactive in our care. To me, using a drug or surgeries to hide a symptom rather than addressing the patient's lifestyle violates that code. Without access to trained integrative doctors, many patients were stuck with drug fixes, poor information, and risky supplement experimentation. If we only focus on acute care, we're missing a huge opportunity to stay well and avoid long-term treatment. Did you see an immediate impact after the legislation went through? Yes. After insurance coverage went through in 2011, new patient numbers in New Hampshire skyrocketed. The demand was already there; it was just pent up behind a barrier. What other trends are you seeing now that insurance reimbursement has gone through? The smartest insurance companies are covering integrative care and using it as a market advantage. They know that costs will actually go down for them and their members, not up. I feel lucky to be in this position and be able to participate in this milestone for the industry, doing my small part in creating access and opportunity for all patients to take control of their own health. For more from Dr. Chasse, visit her profile page on Integrative Wisdom.